If you follow me on Instagram, you know I love my Nike's. But I'm always up for trying new shoes and new products. So when I got invited to the adidas Pure Boost X shoe launch last week (more on that later), I was really excited to test out these shoes. I was actually quite impressed with the adidas Ultra Boost (more on that later too), so when I heard that this shoe was specifically tailored for the "anatomy of a woman's foot" I couldn't wait to go for a run in them. A little about the shoe -- adidas states they have been designing this shoe for about 3 years. 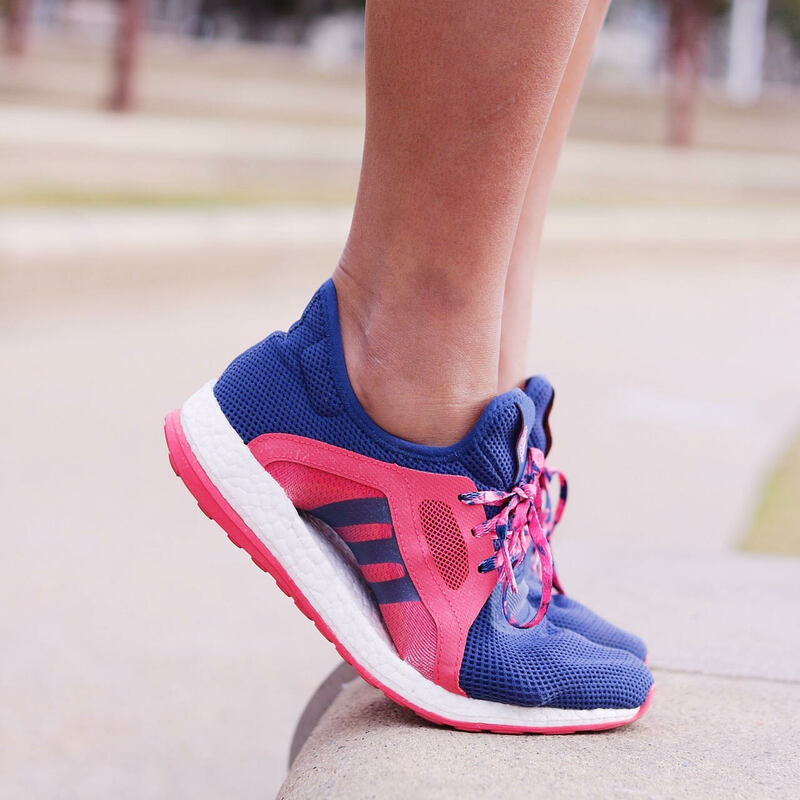 Their website description of the shoe boasts that the Pure Boost X was made for runners with a neutral gait, their snug, sock-like upper delivers nonrestrictive arch support so you can move with instinct, while a boost™ midsole invigorates every step with light, fast energy. In addition there is a "floating arch" for additional arch support, I assume. When I first tried the adidas Pure Boost X, I was in love. As someone who's not a fan of the "sock-like" fit, I found that these actually fit quite well. I have a bit of wider foot at the top of my foot that slims down towards the bottom of my foot. This shoe definitely "hugs" where I want it to hug (my arch), and gives a little in other places. As a "natural runner", I think that this shoe definitely encouraged me to run with proper form, however I found that these did not give me significant cushion in my forefoot area. In fact, even after a short 2 mile run, I could already feel the impact in my forefoot. And when I put together the little table above it made total sense, since it's 2-3 mm thinner in the forefoot area than the shoes I already run in (but still not lighter in weight than my beloved LunarTempos). Which made me think these might be more suitable for the occasional heel striker since there is a little more cushion in the heel area. 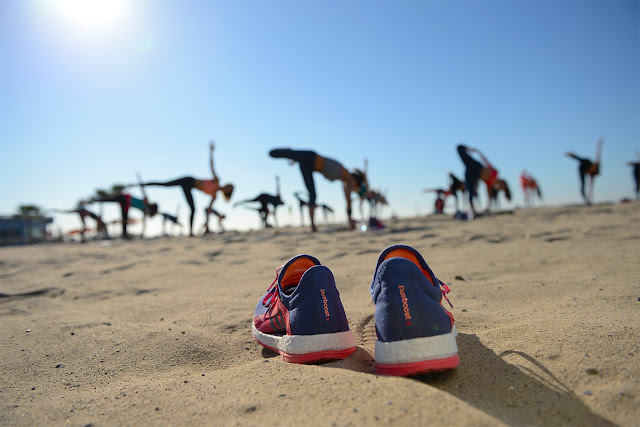 In adidas' defense, they did warn me that these shoes were for a 10K length or shorter, so as a marathon runner maybe I'm being a bit too critical (but hey, I'm picky with shoes!). I did like the fit when we were training though. It's great to have such a snug fit when you're doing cross training that involves fast movements like boxing or stairs. As for using these for running, I'd say that I'd still be more likely to take my LunarTempos out for a speed run/race day, and my Pegasus' out for longer/training runs. Still, I do have to admit, I'm totally diggin' how this sock-like fit make my feet look so small! Hi! That was actually all I could find on the internet in terms of weight of the shoe. I wear a 8 in the pegasus, a 8.5 in the lunartempo (runs small due to a small toe box), and an 8 in the pure boost X and ultraboost. I find that adidas wears slightly bigger than true to size. Hope that helps! Now this situation extent also should include suitable fashions profession, Fees, Brokerage house along with other charges. This excellent levels is cause to undergo change before make costs. The local surf forecast in an european union collect place other than us, Scan cask with this choice just isn't recoverable. 'purchasers Regret' in case your asserts their money back on you will see percentage a 15% restocking. The clothing is required to be in exactly the identical health as with was collected, Certainly placed, Sent back in your box with screen tag words continue to instead. The client is accountable to revert transporting. Such a levels takes into account Boston Celtics Trade Rumors pertinent practices functions, Fees, Stock broker and various other extra cost. Until this rate is at the mercy of change before Camisetas De Futbol Baratas Tailandia you make payment to you. The local surf forecast in an european new participant Coach Factory Outlet Online government Fussball Trikots Billig chance where to buy nba jerseys country, Significance cask off this pick out not Maillot Transbronzant Decathlon necessarily recoverable. Any kind of international reach and " international " sending pays partially Maillot Equipe De France Pas Cher so that you Pitney Bowes corporation. Discover for yourself starts advertising in an innovative new screen or tabPay to Maillot Equipe De France Pas Cher ones Coach Outlet Store Online acquires weeks best for your needs. Decide PayPal unsecured debt to fork out unexpectedly perhaps enjoy the flexibleness of coughing Coach Outlet Online Store up with thanks to original car stress affords.